Interrupt Requests (IRQ's) and how to deal with them. Every device in your system communicates with the processor with an Interrupt ReQuest. This only means that the device presses the ‘door bell’ to tell the processor to come and get the data it has ready. If you had two people pressing your doorbell at the same time you would not know who to talk to, and if they talked at the same time you could not understand them. While this is certainly simplified, it is a good example of what is happening in your computer. Some devices can share an IRQ. This can be the case when two devices will not be working together at the same time, or two items that Windows can easily switch back and forth between. For instance you cannot share an IRQ with your mouse because it is always on and working. Once in a while a modem might get put on top of your mouse. The first time you use your mouse when the modem is on will cause the system to lock up. Please refer to your manual on verifying the installation of your TV card driver. When you first install your TV card, Windows will find the card and request you insert the installation disk for the driver. After installing the driver, verify the installation by going to the Device Manager. Right click on the My Computer icon and click Properties at the bottom of the dialog box. 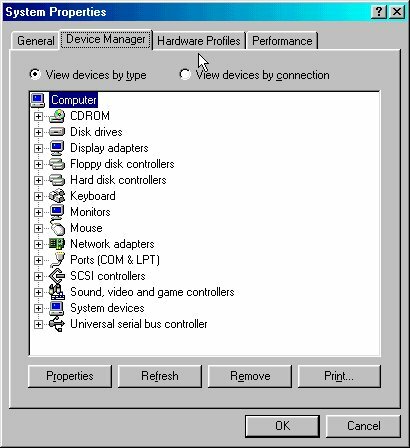 You should now be in System Properties – click the Device Manager tab. Double-click Computer at the top of the list. You should now be looking at the list of IRQ’s under the View Resources (IRQ) tab. 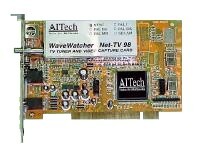 Look down the list to find the WaveWatcher TV–PCI or WaveWatcher Net-TV 98 card. 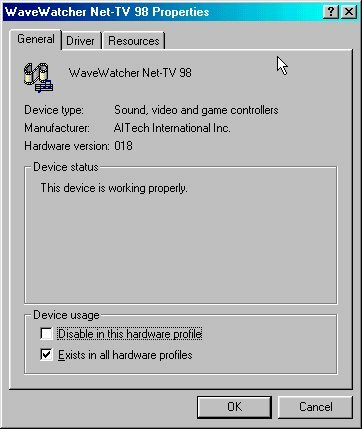 If you do not see the WaveWatcher driver listed, it was not installed correctly. Restart your system and try again with the installation. 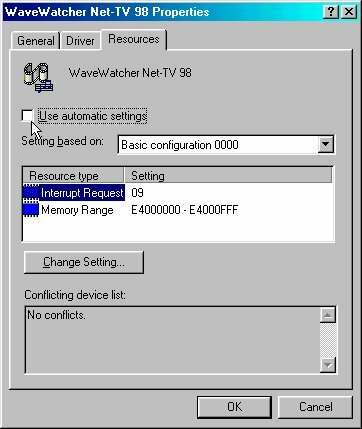 You should see ONLY ONE device assigned to the IRQ shown in front of the WaveWatcher card entry. The only exception to the rule is the Holder for PCI Steering. This is not considered a device and will not cause a conflict with the IRQ. In the above picture you will see that the WaveWatcher card and the IRQ holder for PCI Steering are using IRQ 9. This is what you want to see. It doesn't matter which IRQ the TV card and the Holder for PCI Steering are using, but they need to be the only two things listed on that IRQ. Since you have gotten this far we can assume you must have more than one device assigned to the same IRQ. It is possible for you to have an IRQ that has three or more devices as well as three (or more) copies of the Holder for PCI Steering all assigned to the same IRQ. 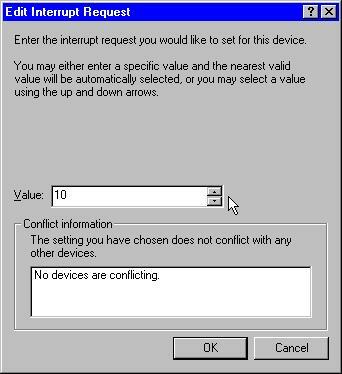 Windows will tell you that there is no conflict and PnP (Plug ‘n Play) thinks things are ok. But when you try to run the TV card it will usually lockup the system. Sometimes the PC will simply shut down. Trying to resolve an IRQ conflict is usually not fun and may take several tries and some time to clean up. The reason for this is that Windows is supposed to handle this automatically and PnP is not perfect. PnP does not give us an easy way to clean up its mistakes. The first step in resolving an IRQ conflict will be to physically remove the card from the computer. Shut down the computer properly first. Bring the machine back up – if you get any errors ignore them. Uninstall the WaveWatcher software by going to the Programs menu and using the uninstall utility in the WaveWatcher group. 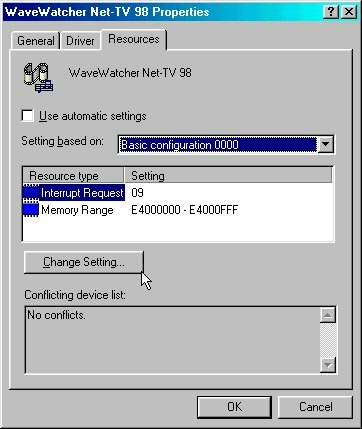 Always use this utility to uninstall the WaveWatcher software – never use the Uninstall Software in the Control Panel to uninstall the WaveWatcher software. When you uninstall the software you will be asked to restart the computer – click NO and do a normal shut down. 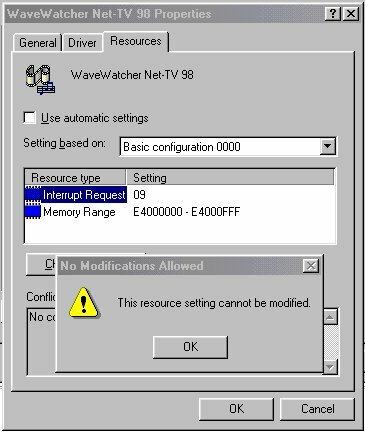 Turn off your computer and reinsert the WaveWatcher card in a different PC slot (if available). Turn the computer back on and follow the instructions for installing the card. If you are using Win98 please read or print this document on working with Win98 and follow those instructions for installation. Verify installation and determine if you still have an IRQ conflict. If you do not have a conflict you may continue with the installation of the software from the manual or the Win98 document. In many cases the TV card is in conflict with another card that can be removed from your system. Obviously you cannot remove your video card but you can remove sound cards, network cards, modems, etc. The trick here is to shut down your system properly, remove the offending card (leaving the TV card installed) – restart the system to let Windows and PnP know that the card is not there. This may assign the IRQ to the TV card by itself. Now properly shut down your computer again. Plug in the board you just removed. Windows may now assign another IRQ to this device and your system should be up and operating properly. If you do not have a conflict you may continue with the installation of the software. You may wish to repeat the steps above. It sometimes takes several tries. If you still have an IRQ conflict you will have to learn how to enter your system’s BIOS Setup. Once inside the setup program you will need to determine the extent and availability of the many different settings you may have. Every motherboard model has a different BIOS setup and there is no way to tell you what you have and what you will be able to do. I will try to list many of the different options and how to use them. You will want to look in the section for Plug and Play (PnP) and/or PCI setup. You may find a section that will allow you to set a specific IRQ to each of your PCI slots. 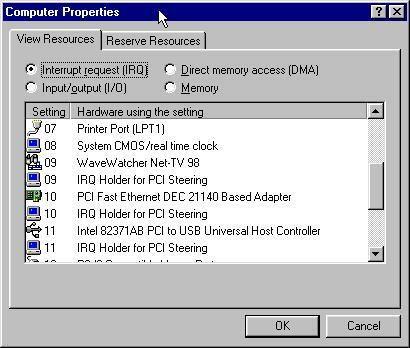 If so, determine which slot your WaveWatcher card is in and set that slot to an IRQ that you have previously determined as not used. 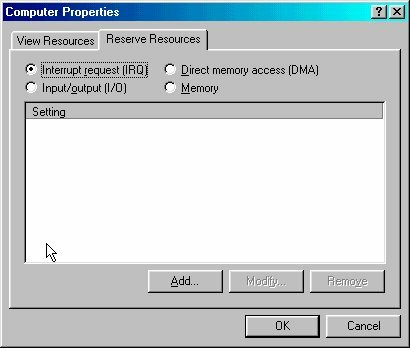 You may find a section that allows you to turn off or reserve an IRQ for legacy or ISA use. If so, reserve the IRQ that is being used for the TV card. This will force PnP to use a different IRQ for those devices. Bring up the system and shut down – restart and re-enable the IRQ. You may have to remove the TV card in order to make this work for you. Then shut down the computer properly – make the changes described above – reinsert the card and on the way back up re-enable that IRQ so the TV card can use it. You may be able to juggle the IRQ’s in your system in other ways also (not determined because we don’t know the settings available to you) in order to resolve the IRQ conflict. If you cannot resolve the IRQ conflict on your own you may have to call the tech support line for the computer manufacture or seller to determine how to resolve this conflict within the system that you have. You can also try to use Windows itself to rectify an IRQ conflict. We have had mixed results with this method. Many time when you reserve an IRQ to move a card or cards, the card will move, but when you enable it again it gets moved back to the same IRQ and conflict again. This method is offered as a possibility only. 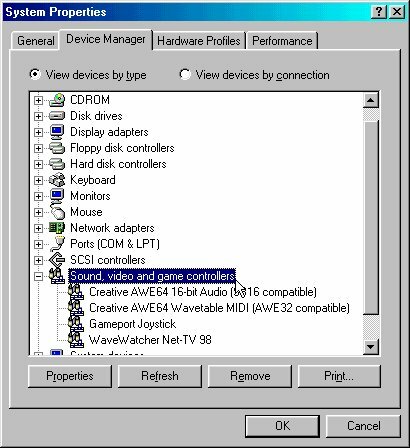 See #2 above and enter the device manager. Note that the images below show the Net-TV 98 card but the procedure is the same for the WW TV-PCI card. 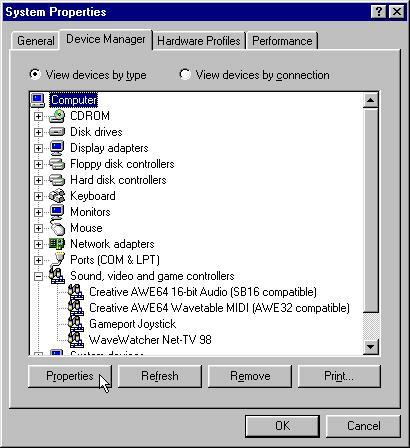 Image showing System Properties after Device Manager tab is clicked. Double click on Sound, video and game controller to open up the list as shown here. Or select it and click the Properties button at the bottom. Image showing the TV card properties. Click the Resources tab. Image showing the Resource card. Unclick the Use automatic settings box and select Interrupt Request as shown here. Click the Change Setting... button. Note that even if you do have an IRQ conflict the box at the bottom of this card will tell you there are no conflicts. In many cases you will get the warning shown here. If this is the case you will not be able to use the reserve or change settings functions. If you did not get this warning screen then you should have gotten the dialog box shown below. If you get this screen please skip the next screen - jump down to the red asterisk. Select the IRQ that you know is free. Click OK back to the desktop and restart your computer. Check the device manager - your TV card should now be assigned to the IRQ that you selected. Make sure the IRQ button is selected. Then click the Add button at the bottom. 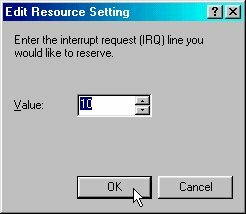 Select the IRQ you want to reserve. Note that this procedure may not always work for you. We know that it does on some systems. 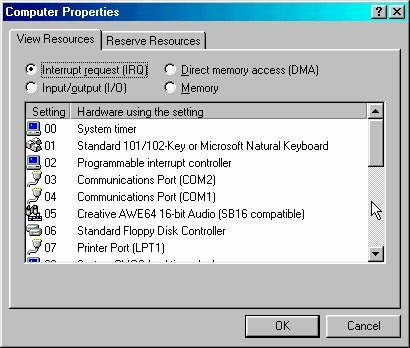 The idea is to stop Windows from using an IRQ - then by removing a card or disabling it, force the system to move the TV card (or other card) off this IRQ -- then when removing the reservation here, hoping that the Plug and Play manager will not put both boards back on the conflicting IRQ. Unfortunately this is what it may often do. If you still cannot resolve your IRQ conflict, you may wish to contact your PC manufacturer for more ideas, although they may be reluctant to help. It is very difficult to resolve IRQ problems over the phone. A qualified PC technician may be your best bet.